IMPORTANT: TICKETS PURCHASED THROUGH VIAGOGO, TICKETMASTER RESALE AND OTHER SECOND-HAND PLATFORMS WILL NOT BE VALID ON THE DAY. All attendees names MUST be on their ticket, matching their ID. 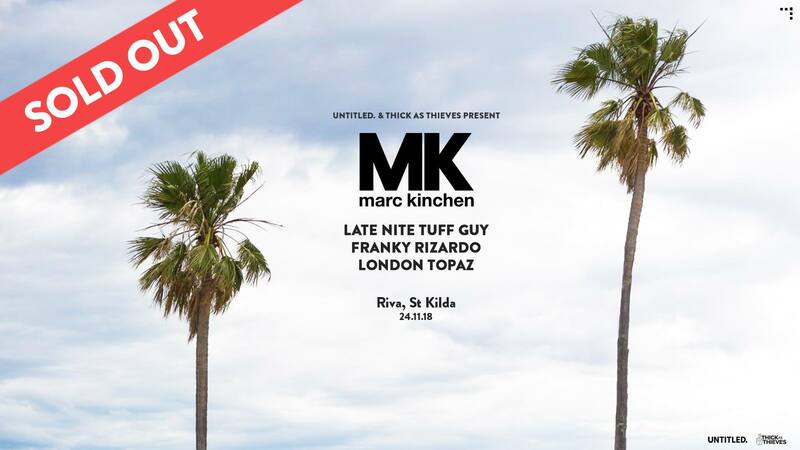 Untitled Group & Thick as Thieves are proud to present revered producer, remixer and DJ, MK, who will be playing at the iconic beachside Melbourne location Riva St Kilda this November! Located on St Kilda beach, ‘Riva’ is situated with the best views of Melbourne bay and the city skyline. This party will kick off the summer season and is one not to be missed! All attendees names MUST be on their ticket, matching their ID. Security will be checking this on the day.